*Conditions Apply: Prices are per person, capacity controlled and listed in Australian dollars twin share including port taxes. Prices may fluctuate if surcharges, fees, taxes or currency change, and may be withdrawn at any time. Prices shown here are not shown in real time. While we endeavour to keep our pricing as up-to-date as possible, the advertised prices shown here may differ from the live prices in our booking system. The prices shown are for a cash payment. Credit card fees of up to 2.5% will apply. Offer correct as at 15Mar19 and subject to live availability at time of booking. Prices are per person twin share based on best available cruise fare, inclusive of all discounts unless otherwise stated. All offers are capacity controlled and can be withdrawn or modified at any time without notice and subject to availability at time of booking. All passports, vaccinations and visas are the responsibility of the travelling guest to secure prior to departure from Australia. Cruise deposit, amendment and cancellation conditions apply. Travel agent service fees not included. Prices do not include airfares, transfers, or hotel accommodation. ^Drinks on board do not include Champagne and wines on the exclusive wine list. Special conditions apply - please ask for full details at time of enquiry. Offer ends 18May19 or until sold out/withdrawn from sale. This cruise offer is provided by Cruise Abroad, please ask your travel agent to contact us for more information. 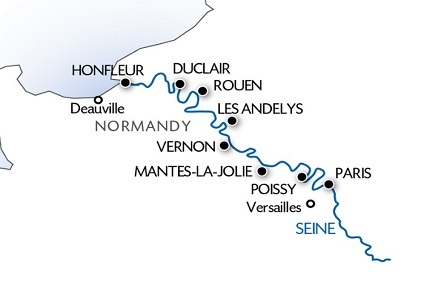 7 Night Cruise sailing from Paris roundtrip aboard Seine Princess. Passengers are welcome to board our ship at 6:00 p.m. After comfortably settling into your cabins, we'll introduce our crew at a welcome cocktail before dinner. Join us for a cruise through Paris "by night" (depending on the water level). CLASSIC: Panoramic tour through Paris exploring its legendary places. DISCOVERY: Stroll on the banks of the Seine and over the bridges of Paris. We'll set out from the Quai de Grenelle for a stroll along the banks of the Seine. You'll be free to explore the city on your own this afternoon. Optional excursion (not included in the packages): Tour Paris in a vintage 2CV. Experience true vintage style as you cruise in a comfortable and completely refurbished 2CV. It's fun, it's fabulous, and it's so French! This morning will be spent cruising. Join us on an optional excursion for both packages: We'll leave for a tour of the Claude Monet Foundation in Giverny - the second most visited spot in Normandy after Mont Saint-Michel. Enjoy an evening of entertainment. We'll start sailing towards Duclair. This morning will be spent cruising. Join us on an optional excursion for both packages: the Norman Abbey Circuit. Our ship will set sail towards Honfleur. This morning, join us on an optional excursion for both packages: Discover the Côte Fleurie from Deauville to the Château du Breuil, complete with a Calvados tasting. In the afternoon, join us on an optional excursion for both packages: Guided tour of Honfleur. Full-day optional guided tour (lunch included) to the Landing Beaches (only as a pre-booked tour and valid for a minimum of 30 participants). We'll spend this morning cruising. Join us on an optional excursion for both packages: Guided tour of Rouen. Enjoy an evening of entertainment. CLASSIC: Visit of the Château de Martainville. DISCOVERY: Walk to the Château Gaillard.